Sometimes you just can’t decide what you want to eat! That’s where buffets come in. If you’re looking to have some seafood, Italian classics, a salad on the side, or maybe an array of breakfast options, the delicious buffets of Michigan have it all. From extensive casino buffets to locally-sourced options, here are the 10 best buffets in Michigan. The Harvest Buffet at the Gun Lake Casino—casinos commonly have fantastic buffets in Michigan—features a heavy dose of locally-sourced foods. While that might seem to leave a lot of stuff out—forget about finding cacao trees in Michigan for chocolate, let alone crab legs and shrimp—there's plenty of imports here as well. Better yet, there are different items in play most every night of the week, from Friday's prime rib and crab legs to Sunday's comfort food and crab legs. No, crab legs aren't out every night of the week, sadly, but still. New Buffalo's biggest attraction, the Four Winds Casino, comes with a buffet spectacle all its own. Set in a room with a lobby and line-up facility made from whole logs, the buffet features a variety of foods depending on when you go. Weekends feature a brunch buffet complete with omelet stations, as well as an enhanced seafood buffet that features shrimp, crab legs and more. Those with nothing else going on Thanksgiving, meanwhile, can even hit the special Thanksgiving buffet that boasts turkey and all the trimmings, as well as ham, prime rib, shrimp, and yes, crab legs. On Sundays, Kalamazoo's Bravo runs one of the most impressive brunch buffets around. Featuring waffle and omelet stations, fruit, salad, cheese plates and more, you'll run into old favorites alongside some exciting new dishes as well. Perhaps the best part of the Bravo brunch is the dessert section, which features not only a fruit and cake trifle, but also white chocolate mousse and a variety of cakes. Thursday through Sunday, the River Lake Inn offers up what's known as the Family Buffet, a selection of “home-cooked favorites.” Friday and Saturday, though, it expands to the Land and Sea Buffet, which features a variety of ocean favorites including crab legs, as well as a variety of other entrees, side dishes and salads. Mackinac Island's Grand Hotel is one of the leading tourist destinations in Michigan, and it's also home to a legendary lunchtime feed known as the Grand Luncheon Buffet. 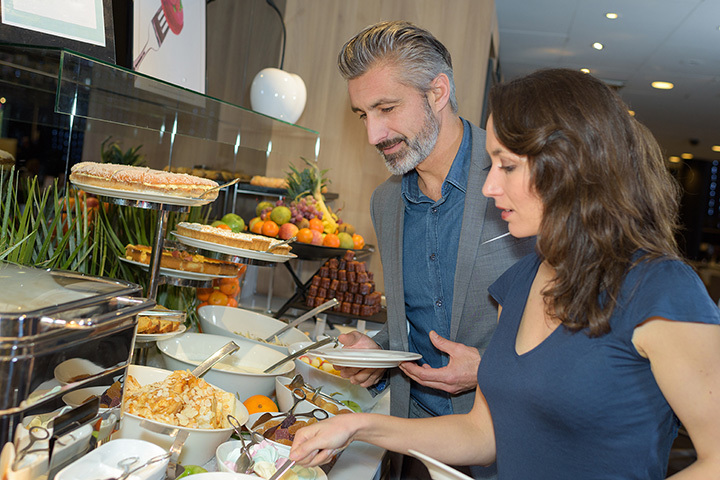 Featuring “hot and cold entrees, seafood, salad, fresh fruit, cheeses, a selection of meats, and desserts baked fresh daily,” it's a dizzying array of options that will likely prove unforgettable. It's also landed a Certificate of Excellence from TripAdvisor, which should underscore just how amazing the Grand Hotel's lunch really is. A breakfast buffet in a hotel isn't exactly new, but this one is noteworthy. Grand Rapids' Six One Six at the JW Marriott parts company with expectations. A breakfast buffet beloved by many who take a run at its fruited plains, you'll have a staggering variety of options here. Featuring many of the standards like omelets and waffles as well as exciting variations like smoked salmon, chances are you won't go away hungry. Despite being in Holland, Alpen Rose Restaurant has a distinctly German flair to it. Beyond the rindsrouladen and huehnerbrust in pretzelkruste, however, is a surprising array of buffet options. You'll not only be able to get in on a lunch buffet, but there will also be a Sunday brunch featuring an array of entrees along with soups, fruits, vegetables and plenty more. There's even a special Thanksgiving buffet for those who'd rather not cook. Naturally, Detroit has to be a leader in great buffets, and thanks to its lineup of casinos, there's plenty of those to be had here. The MotorCity Casino's Assembly Line Buffet may sound too industrial to be good, but man, the options here will blow your mind. Each night has a different theme—the seafood buffet, for example, is a Monday night event. Following that, there's a Mediterranean night, a barbecue night, Caribbean, steak house, Italian and soul food nights to round it out. While on the surface, it's good enough as a Japanese restaurant—a Japanese seafood restaurant, no less—featuring not only dim sum but also an array of seafood dishes, it was their Friday night special that is truly incredible. Fridays at Fuji Buffet feature the Lobster Feast, an all-you-can-eat lobster buffet that should be impossible, yet is not. Ann Arbor's Madras Masala is home to some very exciting developments in Indian and Indo-Chinese food. Some go so far as to say it's among the best, if not the best, in town. That's strictly a value judgment, of course, but what's really noteworthy here is that they'll actually set out the lot for a lunch buffet every day. Featuring a choice of dosas and followed up with a range of vegetarian and meat-based dishes, you'll be able to try out a range of tasty items here.